About this lever knitting business: several of you asked why I’d want to learn a whole different way of knitting, and it’s a good question. I am the kind of person who wants to know about this kind of thing just because it exists and because it’s so significant to the history of the craft (knitters who had to work fast enough to earn a living at it knit this way; our more familiar throwing and picking styles emerged from a desire to make the process of knitting look more ladylike). I can’t yet lever knit effectively enough to make it faster than my usual throwing. But it does, in the mean time, let me use my hands and wrists in a different way, and as I now know from my class with Carson Demers, that’s a good thing. My work is all about using the computer, and between that and my knitting habit I’ll need to be careful if I want to avoid repetitive stress injuries. I was almost the only person in Carson’s class at Madrona who didn’t already have problems in the wrists, elbows, or shoulders, and I want to be able to knit in comfort until I’m dead. So changing up the positions in which I knit is a really good idea. So back to this little practice sweater. 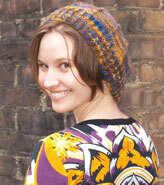 I had the one lovely skein of Toots LeBlanc Jacob/Alpaca DK, but I knew it wouldn’t stretch to a whole sweater. I had some Rowan Felted Tweed in the stash that was about the same weight, so I figured I’d add a hem in colorwork. I thought I remembered Lizbeth Upitis’s Latvian Mittens having some nice large botanical motifs, and sure enough I opened the book right to the page with the chart for Graph #53: District Unknown. And I only needed to increase three stitches to fit in three repetitions of the motif. 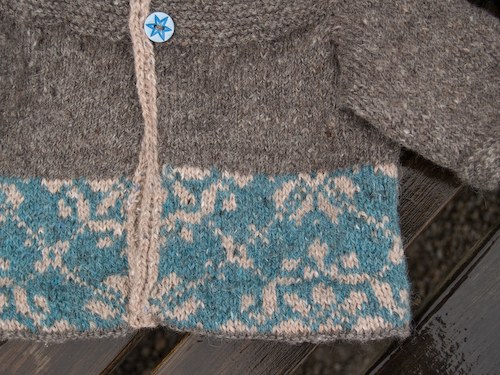 I only worked half the chart because I didn’t think a long cardigan would be very practical on a three-month-old, but I quite like the sort of wallpaper effect that results. There was still the problematic neckline to deal with, though. I tried tacking it down a couple of different ways, but I just wasn’t satisfied. A hood seemed like the best solution, so I quickly knit one up in the Felted Tweed. 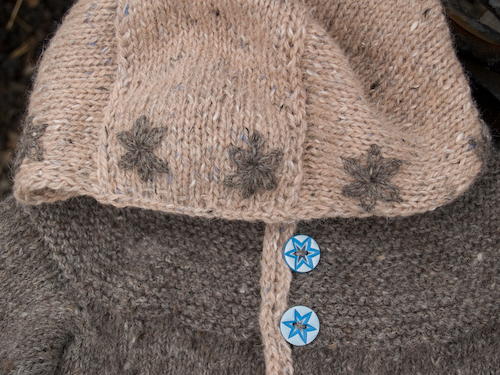 And since I’d already given up on this little cardigan being unisex, I thought I’d use the last yard of the Toots LeBlanc for a little embroidery to match the buttons. Ta-da! 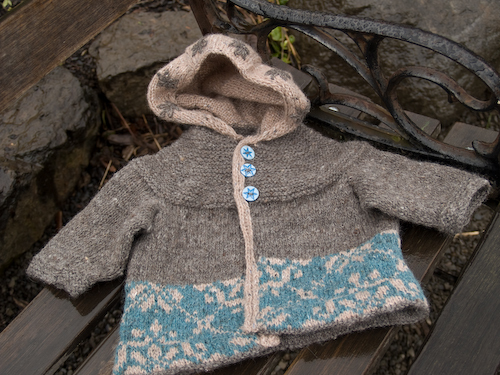 Another little sweater banked against the onslaught of 2010 babies. I really want a whole grown-up sweater’s worth of the Jacob/alpaca. So tweedy. So full of character. Love it. No pictures yet because it really needs a blocking, but the little lever-knit sweater I’m calling Baltic Rose is all finished! Although I still had about six short rows to go when they extinguished the Olympic torch, I was finished and able to give the closing ceremonies my full attention by the time they rolled out the giant inflatable beavers in the finale (which was like a Bollywood musical number with lumberjacks), so I’m awarding myself a lever-knitting medal. And really, if I hadn’t decided at 3pm that what my little sweater really needed was a hood, I could have been done by the time the gold medal hockey game was over. Pictures soon and full details soon, I promise.